One of my favorite roses is NEW DAWN. Healthy. Beautiful. Low maintenance. Sweetly fragrant. 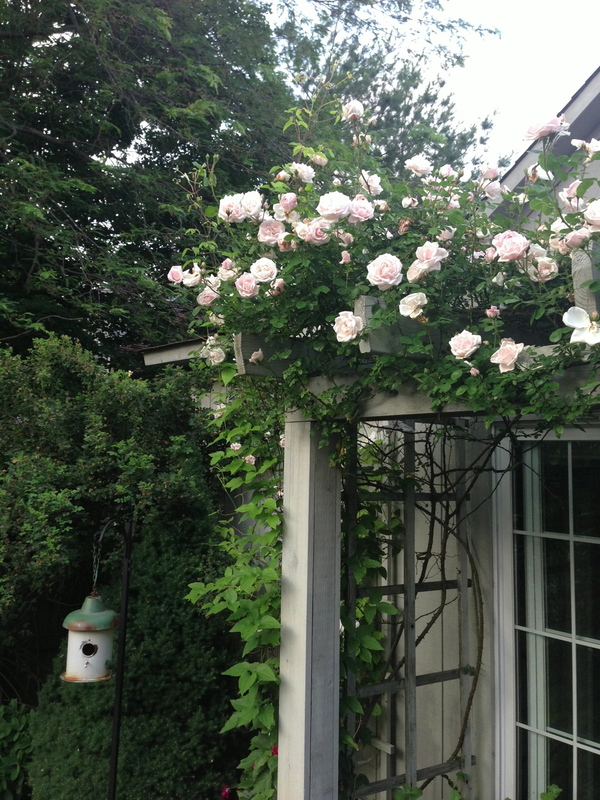 New Dawn is a large-flowering climber that was introduced in the 1930s … a “modern” rose with old rose charm. In 1997 New Dawn was voted the most popular rose in the world at the 11th World Convention of Rose Societies. It actually was the first plant to receive a patent. It is hardy in Zones 5 – 10. And, I learned this spring that it’s P Allen Smith’s favorite. 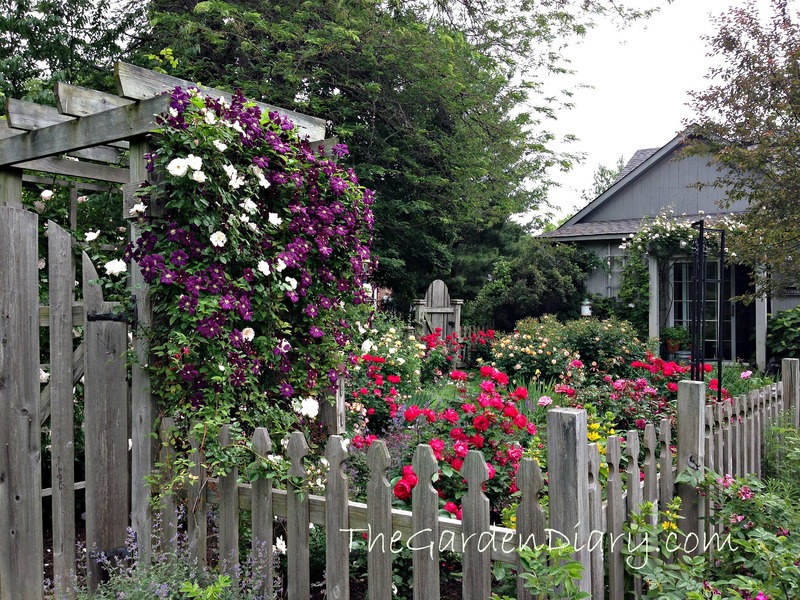 When I was in Arkansas for Garden 2 Blog, New Dawn was everywhere, on fences, trellis, in cemeteries and the walls of buildings. New Dawn in full bloom, especially in mass, is breathtaking. 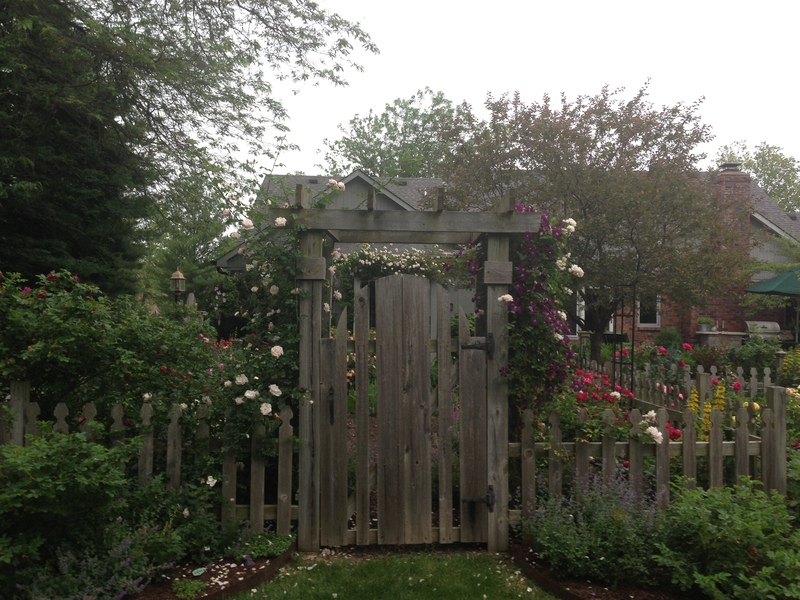 Here are two trellises that face each other in one of my garden sections… both are laden this week with New Dawn! I have three of these beautiful roses. One covers the pergola over my potting shed porch. The other 2 are on an arbor over a garden gate. 10 years ago I bought my first New Dawn from White Flower Farm. They sold New Dawn as part of their Dawn & Dusk collection … pairing it with the clematis Etiole Violette. This is a perfect pairing that I would highly recommend! When they bloom in the spring …. they B L O O M. The softness of the petals and sweet fragrance make this rose just breathtaking. It is officially a “reblooming” rose but I don’t see many blooms after the spring bloom. Just like the tag says, this rose is disease resistant and low maintenance however, you need to provide a strong support–this is a vigorous grower. And, I would advise keeping up with the pruning …. it can get out of hand! 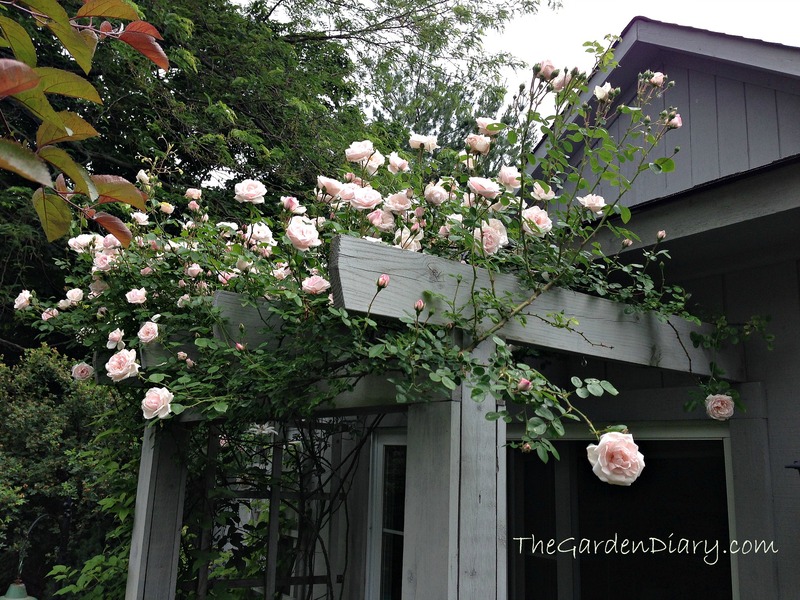 Every 3 or 4 years I do a fairly major pruning to keep the rose fresh. The New Dawns on my arbor were cut back hard last year but have already reached the top! They are hard to discourage! One more thing, when pruning a New Dawn gauntlet style rose gloves will be your friends. Hiding behind those yummy blooms are hooky thorns that mean business! But, once you experience the blooms of a New Dawn rose, you’ll forget all about the thorns. I planted a New Dawn in the garden this spring. So it’s still just a “baby”. 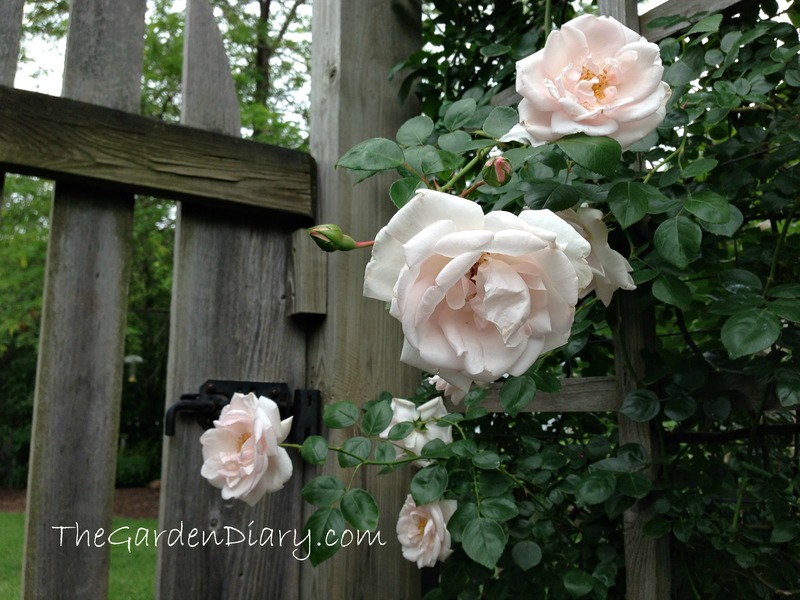 I look forward to when it will climb up on on the fence as it is planted as a “backdrop” rose. I really like the idea of pairing it with the Clematis. Maybe I will plant one with it in the fall. I’m in zone in 8a and it’s too hot to plant right now. I’m enjoying your “rose of the day” very much! These are so beautiful! I can almost smell them. Their fragrance is delicate and sweet! I love it! 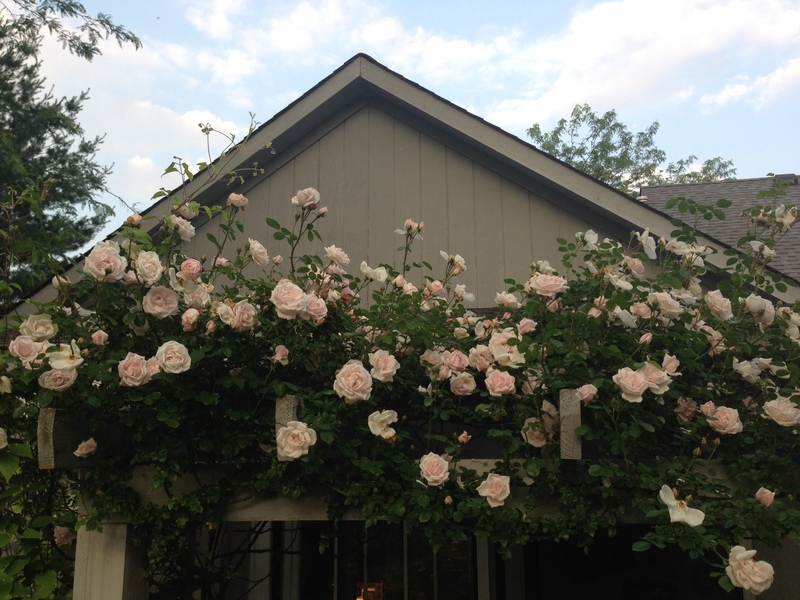 This rose is like a floating, fragrant cloud. So LOVELY. She is a show stopper for sure. Can’t wait to see the ‘show stopper’ you will feature tomorrow! We have 2 New Dawn roses. I planted one in 1985 and it was not until it started to flower properly in 1987 that I realized there was already one growing in the garden. The original was planted in the late 1950’s but, by the time I moved here in the late 1960’s, nobody could remember what it was called. Definitely one of my favourite climbers. Your garden looks lovely! The 1950s rose is pruned quite hard because it grows round 3 windows on the East and South East house walls; it’s about 10 feet high and 8 feet across but would spread further if allowed. It has an early flowering honeysuckle planted next to it which also has a delicious scent. Sounds stunning. I planted an early flowering honeysuckle with a Zephinire Drouhin Bourbon rose and they pair very well together!